Regional Landscape Park “Nadsyansky” is one of the corners of conservation of lowland flora of the Carpathians and the Carpathian Syan River. Park “Nadsyansky” is of international importance, because Ukraine is on the border with Poland and borders with two Polish parks: Park Bieszczady Narodoviy and regional landscape park “Syan River Valley”. 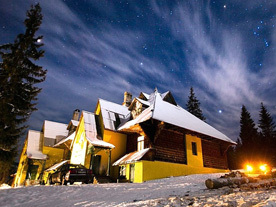 RLP “Nadsyansky” is a part of the International Biosphere Reserve “Eastern Carpathians”. The park covers two completely different parts: in the remote and inaccessible valley of Syan river there are virtually no human settlements, while the other, densely populated valley is characterized by rich cultural hertiage and saved traditional forms of land use. Population of RLP “Nadsyansky” has 9 000 inhabitants in 8 villages in the territory of which are located numerous monuments of cultural and historical heritage. Forests and forest-covered lands occupy 51.6% of agricultural land - 42.9% of the park. Five natural systems, in which are conventionally protected indigenous beech, fir-beech and alder stands green and are included in the core protected biosphere reserve in RLP “Nadsyansky”. At the RLP “Nadsyansky” there is very favorable climate for rest and for research. Here beautiful mountain landscapes are in harmony with peculiar architecture of Lemkies and Boykies. 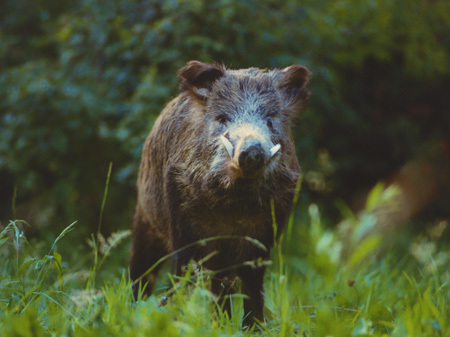 The species composition of animals in the park is relatively poor, with widespread mammals wild boar, roe European, red deer and more. Of reptiles there are adder, spotted salamander, a water snake, Grass snake. 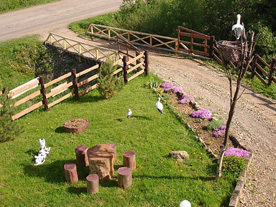 Birds can be observed owl, white and black stork and others. 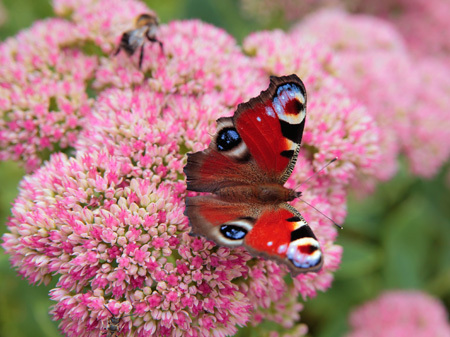 More than 30 species of plants founded in the park are included in the Red Book of Ukraine; many of habitats and some species of plants and animals RLPN are listed in the Annexes to Settlement and Bird EU guidelines governing their protection in the EU. The stow is located in the border zone of Borynsk Forestry, covers an area of 1391 ha. In the stow”Buchok” were discovered the remains of native beech and fir-beech stands virgin nature. For their protection it is offered to create four forest reserves. Bojkies architectural monuments, churches and historical sites. Sokoliky – is one of the most beautiful and little-known corners of the Ukrainian Carpathians, where there is a stone church with rusty dome. Also are worth a visit: Shandrovets, Upper Jablonka, Boberka mountains, Boberka, Upper Turiv, Lower Turiv. 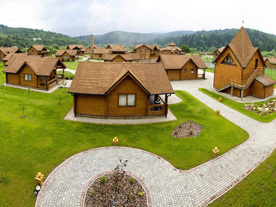 Hotel recreation complex “TAOR-Carpathia" is nestled in the lap of Ukrainian Carpathians, where clean mountain air supplement mineral springs spa resort Skhidnytsia. Offers recreation and relaxation for every taste and fancy, romantic, friendly, medical, business, corporate and family. Tourist center “Boykivchanka” is located on the border of villages Rozluch and Yasenytsya-Zamkova, 50 m from the road, 100 meters from the ski lifts. Has convenient access - paved road. 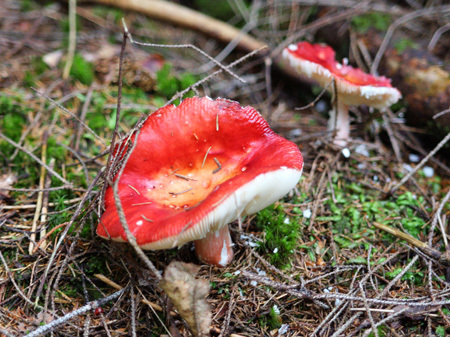 Are offered tours, hiking, picking berries and mushrooms, nearby is a source of mineral water “Rozlutska soda”. 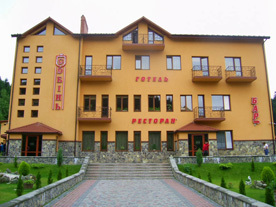 Tourist Hotel Complex “Sobin” is located in Rozluch among upper Dnister Beskydy, 120 km from the city and 12 km from the center of ethnic Boikivshchyna - Turka, at an altitude of 590 meters above sea level. Holiday “Lily” is a nice comfortable rest in the village Kryvko of Turka district known by wooden church of St. Nicholas of 1761, which gave rise to the Museum of Folk Architecture and Rural Life. Manor “Yana” offers a rest in the village Upper Vysotsky, at an altitude of 632 m above sea level. p. m., 30 km from the Turks, near the manor river Stry flows. The land on which it is possible to place the tent, is located near the former village Benova (farm Liska). 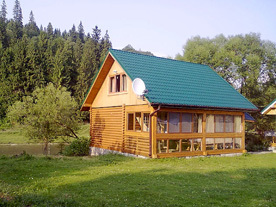 Places are organized recreation near the villages Borinya, Sanok, in Shandrovtsi and Liska. Given the fact that the park is located in the border area, every visitor should always have a passport and tourist trips organized for upland valley of Syan must first obtain the written consent of Border Forces of Ukraine. The nearest banks are inTurka, ATMs are in the city of Turku and village Borinya. All villages in RLPN are served by two Ukrainian cellular operators - UMSMTS and UA Kyivstar. You can take advantage of the Polish cellular area in Syanky village (ERA GSM), and, depending on your location on the tops of mountain ranges or in the valley of the Syan also other Polish operators, in particular, Plus GSM. To ensure your personal safety, please note that the zone of cellular coverage in mountainous area does not cover the whole area of the park. Mail, grocery stores and pastries are all villages of RLPN. Pharmacy is in Bobertsi, Shandrovtsi, Upper Yablunka, Lower Yablunka, Lower Turov and Syanky. rail links - station line Lviv - Syanky - Uzhgorod in Lower Yablunka and Syanky, the train also stops in the Lower Turov, Sokolyk and Benjova. If you plan to come to RLPN by own car, please remember that the road segment between Borinya and Boberka now is in poor condition. From this point of view, in this area the most appropriate type of personal transport is SUV. Petrol stations are outside the RLPN on the main road from the city of Turka though Uzhotskyy pass to the city of Uzhgorod. The park preserves the majority of monuments of material culture, mostly Greek Catholic churches and bell towers - churches in the villages of Upper Jablunka (Holy Mother of God, 1788), Lower Jablunka (Transfiguration 1820), Upper Turiv (St. Panteleymona, 1890), Boberka (Ascension of the Lord, 1913 and St. Michael 1914), Lower Turiv (Assumption of the Blessed Virgin 1914), Dnistryk Dubovyy (Holy Mother of God / Sacred Heart of Jesus, 1920), where unique icons of Rybotytska school and liturgical books of the old, already non-existent, Boykivska wooden church (built in XVI-XVIII), are preserved until now in both modern and non-existent villages. 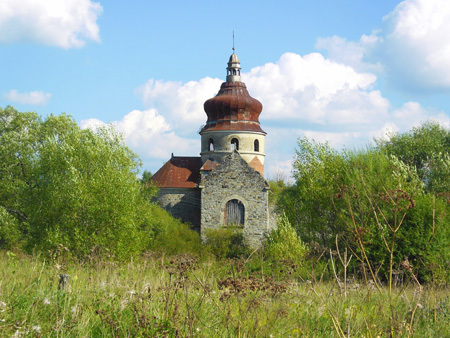 Two old churches, built in the village Syanky in 1645 and 1703 were sold to the village Kostryno (1703) and Silj (1831) in Transcarpathia, which survived until today (now it is the National Park “Uzhanskyi”). In the villages located in the park, traditional Boykivska wooden construction is preserved. A single row courts that combine complex of residential house and stables. One of the estates of the village Shandrovets is built in 1909 on the initiative of Metropolitan Andrey Sheptytsky, was moved to the Museum of Folk Architecture and Rural Life in Lviv. In towns were installed bilingual information tables. Were published brochure of Regional Landscape Park “Nadsyansky” in Ukrainian, Polish, Slovak and Polish. Were marked tourist route “From the origins to the origins of Dniester to the origins of Syan”. The staff of the park issued booklets “Regional Landscape Park “Nadsyansky” and “Environmental and natural history trail “Following nonexistent villages (Dydova)”, which starts in the village Boberka. The said trail was marked, and it was placed 6 information stands. Scientists of the Institute of Ecology of the Carpathians NAS of Ukraine and the State Natural History Museum of Ukraine processed map schemes of allocation of rare and endangered species of vascular plants, vertebrates and insects. Came publication brochures “Rare species of plants and animals Regional Park “Nadsyansky” and eco-regional trail “From the source of the river Dniester to the source of river Syan”, along which it was installed 11 information tables. Additionally, the school in the park received information boards about nature and historical and cultural heritage of Nadsyannya that have been developed by the Institute of Ecology of the Carpathians NAS of Ukraine. With the aim to implement the principles of environmental education administration of the Park began to conduct creative competitions for school children about the natural, historical and cultural heritage of Nadsyannya.